Ballerina skirt is a full skirt that reaches to mid-calf or just above the ankles, worn as a costume in a ballet performance. It is often made up of multiple layers of fabric. It was a popular casual skirt style during the 1950s. Ballerina skirts have been a consistently popular length for formal dresses, especially for young women.The most persistent image of a ballerina skirt is that worn by the most famous ballerina Anna Pavlova. Early ballerina skirts were heavy, bulky and unwieldy, severely restricting the dancer's movements. By the early twentieth century, skirts were raised to the knees to showcase pointe work. The Ballerina skirt is typically made up of five to 12 layers of tulle fabric. A ballerina skirt typically allows the wearer to seem more beautiful, feminine and elegant, as well as being associated with the traditional costume for classical ballet performances. Different types of the ballerina skirts are used in ballet performance including the romantic, classic, pancake, balanchine and platter skirts. 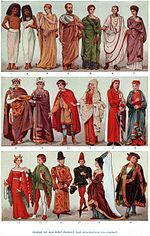 ^ "Encyclopedia of clothing and fashion". Encyclopedia of clothing and fashion RSS. Retrieved July 10, 2017.